Bungalow for sale in Edinburgh | 25 Pearce Avenue | Thorntons Property - Estate Agents in Dundee, Edinburgh, Angus, Perthshire and Fife. 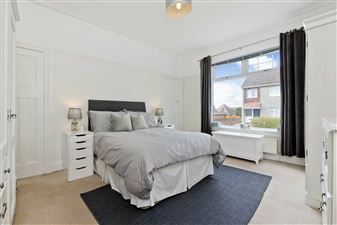 Exquisitely presented and enjoying a wonderfully light and airy ambience, due to its high-ceilinged rooms and understated contemporary interiors, this three-bedroom detached house is further enhanced by characterful features, a manicured garden and private parking, including a detached garage. This inspiring suburban home lies in desirable Corstorphine, within easy reach of the city centre, the City Bypass and motorway network, and outstanding schools, including sought after Corstorphine primary and Craigmount High School. Reached via a neatly-presented garden, the house opens into a vestibule affording access to a welcoming hall offering the first taste of the home's endearing style and charm, with pristine muted décor and a hardwood floor. Leading off the hall and extended by a westerly-facing bay window is a generous walnut-floored living room adorned with elegant ornamental features and arranged around a period-inspired fireplace (with a living-flame fire), flanked by an arched storage recess. Located within a spectacular vaulted extension offering rear garden access is a kitchen promising a wonderfully sociable space for cooking, dining and year-round entertaining. This vast space bathes in abundant natural light courtesy of a dual-aspect, large sky lights and a corner bay window, representing a delightful dining recess with a tranquil garden outlook. Complementing the home's pared back interiors are a wide selection of stylish ivory-white fitted cabinets framed by a contrasting solid quartz worktop. This exceptionally well-equipped space also houses discreetly integrated goods comprising an eye-level double oven, a washing machine, a tumble dryer and a dishwasher, as well as a five-ring gas burner with a statement cooker hood and space for a freestanding fridge freezer. Also featured within the home are three remarkably spacious double bedrooms; all enjoying impeccable muted décor and elegant decorative features. The front- facing bedroom benefits from two useful store cupboards, whilst the bedrooms quietly set to the rear (one with further storage) yield lovely garden views. Finally, boasting a sophisticated tiled finish, is a classically-styled bathroom replete with a WC-suite and a sumptuous original roll-top bathtub with a shower tap attachment and an overhead shower. The property is heated via an efficient gas central heating system (newly installed in 2018) and is double glazed throughout, whilst an expansive loft space offers development potential with the correct permissions. Externally, the house further benefits from a substantial rear garden incorporating an immaculate bordered lawn and a secluded sunken dining terrace. A front driveway leads to a detached single garage, providing parking for multiple vehicles. EPC Rating - D.
Extras: All fitted floor and window coverings and light fittings to be included in the sale. Smeg fridge freezer available by separate negotiation.